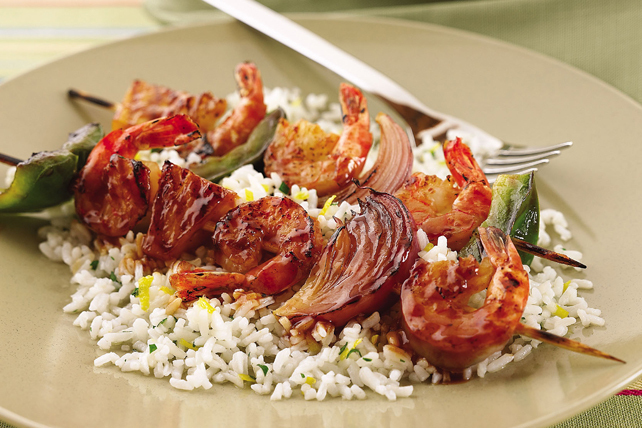 Thread shrimp, green peppers and pineapple onto skewers then baste with some spicy-sweet BBQ sauce. But only if you want amazing kabobs in 20 minutes. Thread shrimp onto 8 skewers alternately with vegetables and pineapple. Assemble kabobs as directed. Place on rack of broiler pan. Broil, 3 to 5 inches from heat, 5 to 10 min. or until shrimp turn pink, turning occasionally and brushing with barbecue sauce for the last 2 min. If using wooden skewers soak them in water first to prevent them from burning.